We looked at Legal 500 and Chambers & Partners, to see if evidence supported the Hungarian partner’s implicit allegation of bias. 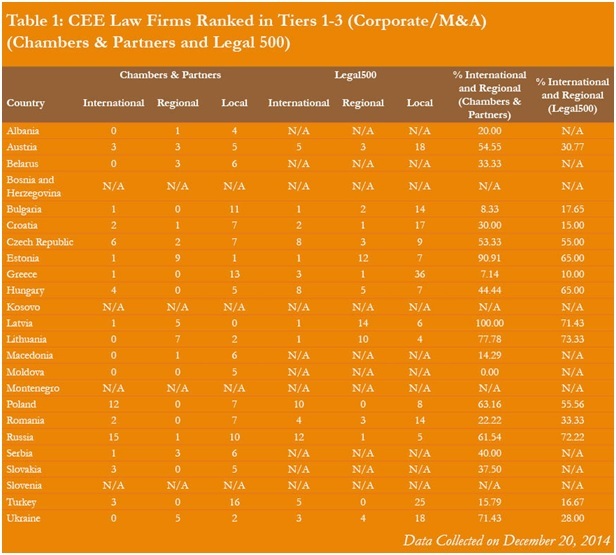 We considered three practice areas, to make sure we captured those in which international firms are traditionally strongest and those in which local firms are often assumed to have an edge: Corporate/M&A (Table 1); Litigation/Dispute Resolution (Table 2); and Banking/Finance (Table 3). And some of the numbers, while not completely unexpected, jump out. 100% of the firms ranked in Banking/Finance in both Russia and Poland are regional or international in Chambers (95% and 91% in Legal 500, respectively). 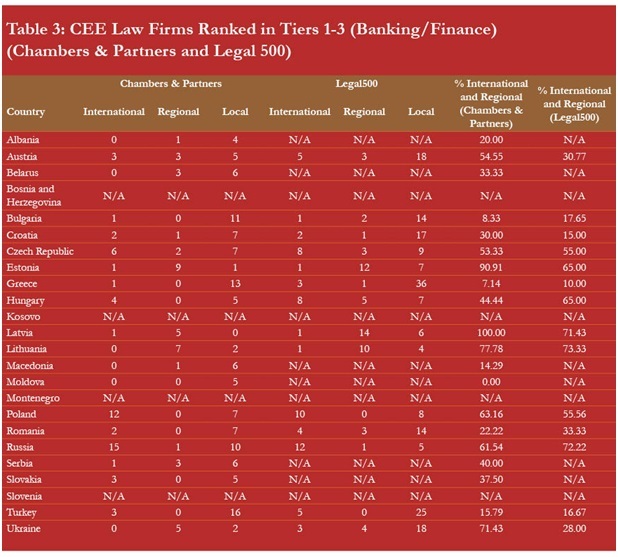 On a regional basis, in the Corporate/M&A practice, in 14 of 22 covered CEE jurisdictions, 50% or more of the firms listed by Chambers & Partners were regional or international brands, and 9 out of 15 CEE jurisdictions covered by Legal500 had the same characteristic. In Litigation/Dispute Resolution, 8 out of 20 for Chambers & Partners and 7 out of 14 for Legal 500 listed 50% or more regional and international firms, while in Banking/Finance the numbers were 12 out of 17 for Chambers & Partners and 7 out of 14 for Legal 500. We reached out to Matthew James, deputy editor of Chamber & Partners, and Mike Nash, editor - The Legal 500 EMEA, to better understand the reason why international firms – which, for the purposes of our conversations with them, include those firms we consider “regional” – make up such a large part of their listings. For the purposes of our review: a local or “domestic” firm is one in which all of its offices are located in one country; a “regional” firm is one with offices in more than one country in continental Europe – but not in London or anywhere outside Europe; and finally, an “international” firm is one with at least one office in CEE, and an office in London, New York, or elsewhere outside Europe. No matter what definitions one uses, however, line-drawing can become difficult. For example, in a number of jurisdictions, because of local bar regulations, firms are sometimes associated/affiliated with an international firm yet keep local names (examples include Bogdanovic, Dolicki & Partners, the associated firm of Hogan Lovells in Croatia, or the Esin Attorney Partnership, the Turkish arm of Baker & McKenzie). We opted to classify these “local firms” as international firms where we knew the working relationship involved exclusivity. By contrast, TSAA in Romania is defined as a “local” firm despite its association with Magnusson. Furthermore, the markets are in a state of flux, and relationships change frequently. Thus, for instance, despite the fact that YukselKarkinKucuk in Turkey is no longer affiliated with DLA Piper, we still counted them as “international” in our tables, since the affiliation was still in place at the time the most recent rankings were published. And differences of opinion are inevitable. Nash at Legal 500says: “I am not sure I agree with your definition of what is international and what is local unless you are saying that any Russian law firm which becomes internationalized loses its right to call itself Russian. For example, in my view, Goltsblat BLP and Egorov Puginsky and Partners would count as Russian. 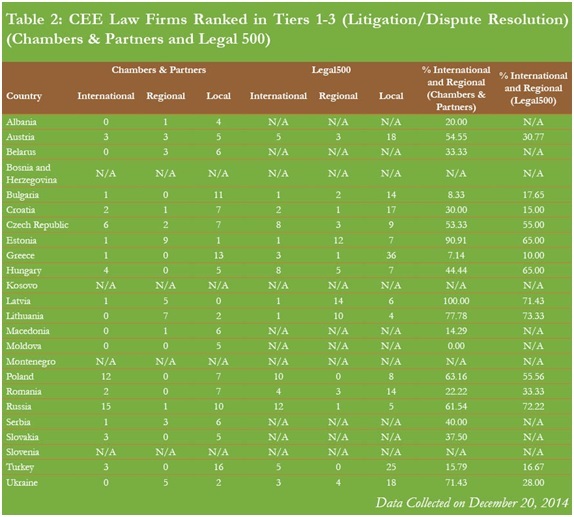 That makes 7 of the 18 firms (39%) in tiers 1-3 in dispute resolution: litigation.” It is worth noting that, even under his definition, the number of local firms in the Legal 500 ranking for Russia is still under half. While both James and Nash emphasized that their rankings are not solely based on law firm submissions, they clearly represent a major part of the calculus. Nash said that the Legal500 rankings are made “on the merits of available evidence,” and although he explained that Chambers also ranks firms that do not make submissions, he pointed out that in CEE markets, “local firms often do not have much information in the public domain, particularly in markets where websites are not really used as a tool by law firms.” For his part, James pointed to submissions to Chambers, as a form of hard evidence of work, described client feedback as the critical component, and noted that it can be difficult to obtain that feedback without a submission. Nash explained that, the single most important point from this is that any law firm which makes a submission immediately enhances its potential to be ranked because it provides data that is not available in the public domain or through third parties such as clients. Indeed, local bar regulations in many CEE jurisdictions prevent domestic firms from advertising client work – even with client permission – which can make it even more difficult to get information from sources other than submissions. This presumably at least partially accounts for Nash’s suggestion that the positive effect of providing a submission “is probably bigger for local firms than it is for international firms” (which can more easily advertise completed client matters in other places and fora). Despite the greater need to provide the rankings with the evidence of their work in the form of submissions, James highlighted that, while in overall terms the number of submissions from local firms would be higher, a greater proportion of the international firms in any given market will probably submit than will local firms. (Nash also asserted that definitely the majority of submissions are from local firms if you look at pure numbers, but his is simply because there are fewer international firms). When asked to explain why local firms do not make submissions at the same level as the international firms, James referred to fewer resources available to local firms, both in terms of smaller budgets and the fact that many do not have dedicated marketing teams to assist those lawyers who “out of habit” might still be keeping track of their work. James also drew attention to the fact that, while international firms have the “marketing institutions in place” to enter submissions across the board, many local firms, for reasons of their own, limit their submissions to those practice areas where the international firms are particularly strong. He elaborated: “Since the assessment is done on a practice area individually, it is unfortunate that many [local firms] choose to focus on Corporate/M&A, which is a highly competitive field with international firms tending to be better positioned in it.” By implication, then, if more local firms made a point of submitting their work in litigation, or labor/employment, or other fields which many offices of international firms tend to ignore, more of them might appear in the rankings. James at Chambers provided the general rule about the difference between international firms and local firms, saying that international firms will almost always provide all of the information that we ask for, as will a number of local firms, but some other local firms who are less familiar with our process might not be as thorough. Was the Hungarian partner who made the accusation about bias correct? Who knows? Certainly James and Nash reject the suggestion out of hand, and without information about the thoroughness and quality of the firm’s submissions (and other evidence of successful client service) there’s no way of knowing for sure. But one thing is clear: In this highly competitive profession, where the fight for clients is fierce and the criteria employed by those clients in selecting outside counsel so opaque, every detail counts. The upshot will surprise no one: Firms should take the submission process seriously, and be thorough, complete, and comprehensive in their submissions.